About an hour south of Santiago, Chile, where city life and congested roadways drift into fields of table grapes and horse farms, is a colonial town named Talagante. Coming in from the highway reveals a land that is flat and lush, with several large grain silos piercing the skyline from the distance. Talagante reveals itself as a working-class community with restaurants, shops, modest homes, and offices. Just beyond the town square—a park with large shade trees and a communal meeting spot—is what is best described as a large stone-walled compound with train tracks leading from the road right through the gate. 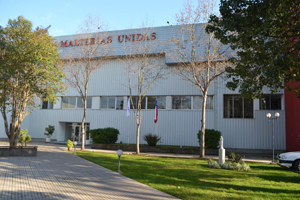 This is the home of Maltexco, the largest provider of malts and grains in this South American country. Through their brand Patagonia Malt, they are making inroads to United States breweries, highlighting Chile’s unique climate that makes it suitable for growing superior grain with great variety. The geography of Chile is ripe for creating world-class malts. Chilean fields are largely protected from diseases, pests, or phytosanitary problems that affect the rest of the world. This is in part because of the Atacama Desert to the north (known as the driest desert in the world), glaciers to the south, the Andes Mountains in the east (the world’s tallest mountain range after the Himalayas), and the Pacific Ocean in the west. “In terms of growing, Chile is an island, and we have outside climate stability,” said Omar Pabst Correa, the generente comercial (chief business manager) at Maltexco. This is helped by the Humboldt Current, a cold stream from Antarctica that covers the country’s coastline, making the water too cold for tourists but contributing to a suitable growing climate. Historic charms present themselves while wandering the grounds of Maltexco. The main office building, which was once the malting house, displays cosmetic cracks in brick walls that have withstood countless earthquakes over the decades (the building is structurally sound). Inside the newer, three-story malting house, new technologies mix with hard-learned institutional knowledge from employees who have spent careers steeping, germinating, and kilning malts. Even in the new facility that houses the kiln for the specialty Patagonia Malt, there is a silo made from century-old Chilean oak (lined with stainless steel), reminding visitors just how old this process is and how times have changed. When they are not working, Maltexco workers can be found on a soccer pitch constructed on the grounds for employee use. Maltexco traces its roots to 1896, when two German brothers with the family name Llorens founded the company. It was acquired by its current owners, the Chadwick family, in 1916 and continued its malting operation and growth for decades until 2005, when the company decided to begin producing more “value-added” products. A year later, it added malt extract and a roasting machine to produce specialty malts. Over the course of the next four years, Maltexco would install a second roasting machine and a new milling system, invest in a pearl barley line, and install a new mill to produce whole grain flowers. Today, Maltexco supplies two industries: brewing and food ingredients. Locally, this has been a great benefit for the growing number of Chilean artisan brewers who had little choice but to use specialty malts from abroad when brewing anything that required more than regular Pilsen malt. “The dark beer made by the local mass-brewer CCU apparently used no special malts at all, just extracts and colorings, so there was not much incentive for Maltexco to produce other malts,” said Kevin Szot, an American ex-pat who opened his own brewery in Talagante (Szot Microcerveceria) four years ago. He and other brewers can be credited with contributing to Maltexco’s change. “First, we’ve given them our feedback as to what a brewer looks for, and they have used our capacity and willingness to do small experimental brews to test some of their new products, such as the Black Pearl (roasted pearl barley) in our stout and imperial stout,” explained Szot. This, combined with a change in product managers and production teams along with the investment in better quality and larger volume roasting equipment, has propelled their malting business with breweries. With distribution strong in South America and growing in Asia and the United States, Maltexco counts a number of well-known breweries among its clients including Heineken, SAB Miller, and AB-InBev along with smaller breweries like Kross in Chile, the Bogota Beer Company in Colombia, and Saya Beer in Bolivia. In 2008, Maltexco signed an agreement with Brewers Supply Group (BSG) to bring Chilean specialty malts into the United States. Not only was this an opportunity for BSG to diversify its portfolio, but since Chile operates on a different climate schedule, it was a way to keep specialty malts available year-round, said BSG’s Marc Worona. “First we wanted to make sure the quality was there,” said Worona. 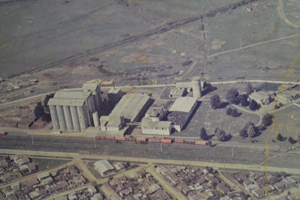 “The history of German settlements plays a big role in Chilean malts.” In laboratory tests, BSG determined that the Chilean specialty malts were very similar to those offered from more established malt producing countries. 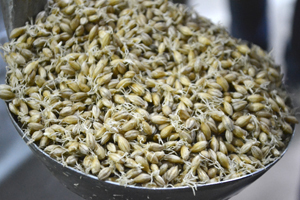 “It is a high quality malt,” Worona confirmed, adding that reaction among U.S. brewers who use the malts has been “overwhelmingly positive.” Worona said that Chilean specialty malts share characteristics of both English and German malts and that the specialty malts can be used to make a variety of beer, not just South American brews. Too many people were getting the Maltexco company name confused with the country Mexico—which does not offer the same growing climate—or even the oil company Texaco, so Maltexco began marketing its specialty products as Patagonia Malt. Branded with a new logo in cool blues and whites with a mountain range framed inside a capital O, the image of Patagonia Malt is one of purity, with a name that most will associate with Chile. 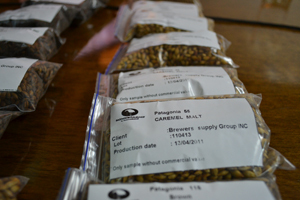 Patagonia Malt is making its way into United States breweries. Three of the four symposium ales offered during the 2011 Craft Brewers Conference—an India Pale Ale brewed by Drake’s, Triple Rock, and Firehouse breweries; the oyster stout brewed by Magnolia, Iron Springs, and Marin Brewing Co.; and the New Albion Porter from Napa Smith and Black Diamond—were brewed with specialty malts from Chile. Currently, many small- to medium-sized U.S. breweries are importing the malt from Chile, and most start off using it for seasonal offerings and eventually year-round offerings, according to Daniel Trivelli, the U.S. sales manager for Patagonia Malt. At Speakeasy Ales & Lagers in San Francisco, head brewer Kushal Hall has been using Patagonia 55 malt in the brewery’s Prohibition amber ale along with CaraMunich and base malt. That particular blend comes from roasting, not kilning, green malt. 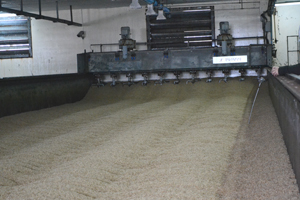 Maltexco works closely with contract farmers who produce barley for malting. They conduct land surveys, perform DNA analysis, and permit the farmers to use only certain fertilizers. Managers visit each farm on a regular basis, and Maltexco has implemented real-time GPS-powered technology that allows officials and farmers to see which areas are most suitable for growing and which are in need of rehabilitation. In all, they are harvesting barley from more than 92,000 acres that stretch from Chillán in the north to Puerto Montt in the south. This is up from just 23,000 acres in 2005 being used to produce specialty malts. 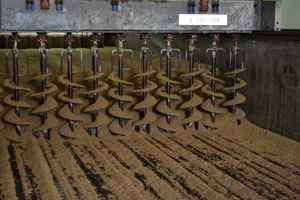 In all, the total malting capacity is 75,000 metric tons per year split between the Talagante facility and one in Temuco, in the southern part of the country. 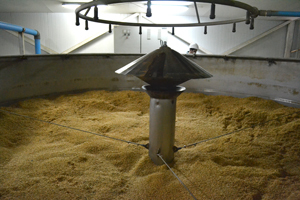 They are producing 3,400 tons of specialty malts per years and 5,000 tons of pearl barley. Last year was one of the best in term of yields and quality. With a passion for American craft beer and an interest in the culture of drinking, John Holl has spent the last several years traveling the country chronicling brewers and the imbibers who support them. A journalist since 1996, Holl has worked as a reporter for the New York Times, the Star-Ledger and the Indianapolis Star.